Swimming With Dolphins: Time To Kick It Off The Bucket List? We were travelling through the Bolivian Pampas in a small motorised canoe, when we became aware that there was something following us. The driver stopped the boat and told us that they wanted to play. Puzzled, we peered into the murky water. That was when I caught my first glimpse of the elusive Pink River Dolphin. They darted about the boat and splashed around playfully for a good few minutes before disappearing off down river. It didn’t last long but it was beautiful to watch and remains a highlight of my 6 month trip around South America. In stark contrast to my experience, I know many people who have swum with dolphins or watched them perform in captivity. 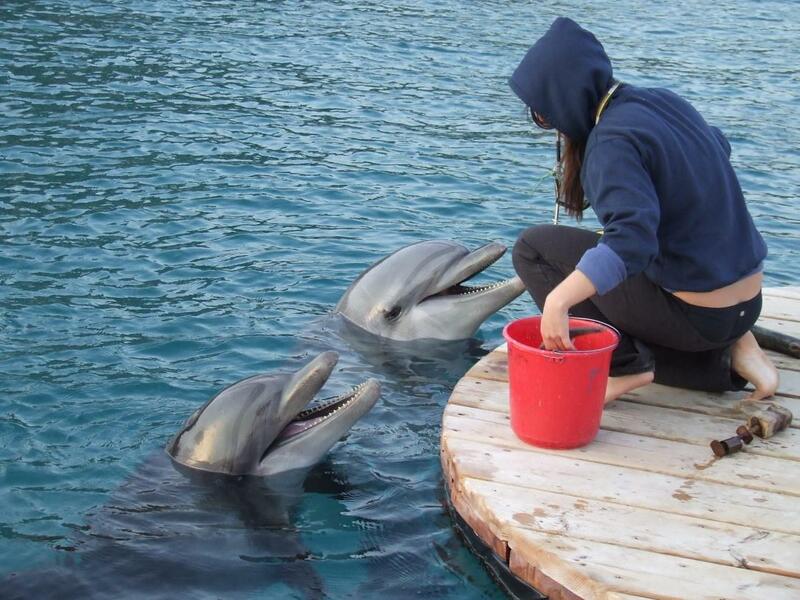 Swimming with dolphins tops most people’s bucket list and our volunteers are no different. I know that many of our volunteers go to these shows each year throughout the world, completely unaware (as I was until a few months ago) that there is anything wrong with it. Few people are aware of the suffering these animals endure in order to entertain us, and I wanted to find out more about it. I spoke to Ric O'Barry, the world famous former dolphin trainer who featured in the must-watch 2009 documentary The Cove, which highlights the capture and slaughter of dolphins in Taiji, Japan. I also spoke to Keith Hutchinson, campaigner and animal rights advocate, and to Laura Killalea from the Humane Society of the United States (HSUS), the world’s largest animal protection organisation, to get their opinions. Their take on this industry really brought home to me how important it is that people hear about the issues relating to keeping dolphins in captivity. From mass slaughters and miserable living conditions to hushed-up attacks on humans – in this blog we look beyond the dolphin smile and ask whether or not it’s time to kick swimming with dolphins off the bucket list. 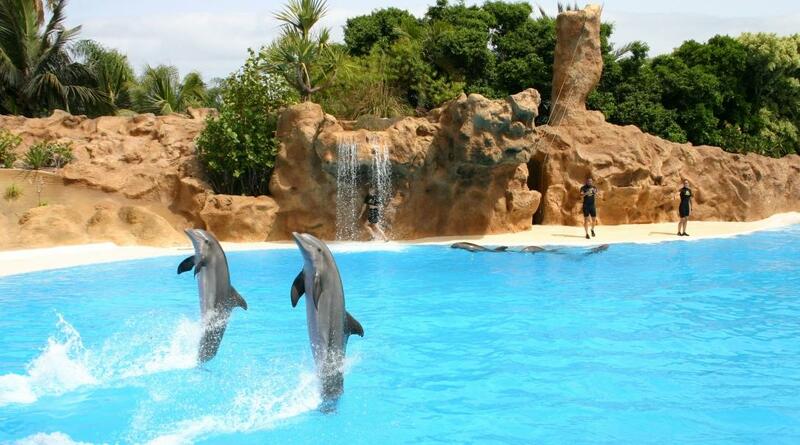 In your opinion, why shouldn't dolphins be kept in captivity? Dolphins are highly intelligent animals that live in complex social groups. Wild dolphins are far-ranging, fast-moving, deep-diving predators that swim huge distances each day. They spend their days mating, foraging for food and playing with other pod members. They use their echolocation to explore their diverse ocean environment. Their sonar is more evolved than that of a nuclear submarine and they express themselves in a very complex language that we can’t understand. Removing a dolphin from its family and putting it into a small, featureless tank with no mental or physical stimulation prevents a dolphin from expressing its natural behaviour. It leads to health problems and, in many cases, a shortened life expectancy. Dolphins are self-aware and capable of abstract thinking. When captured from the wild, they are ripped violently and traumatically from their social units. Once in captivity, it is almost impossible for them to maintain a family group, which is a tragedy for these highly intelligent creatures. How and why did you get involved? While on holiday in Cancun, Mexico in 2008 I finally got the chance to fulfil a lifelong dream to swim with dolphins. From an early age I always had a love for the ocean and in particular dolphins. My earliest memories were of watching repeats of Flipper, the 1960s hit TV series about a bottlenose dolphin. Although I was really excited to get the chance to swim with dolphins, during the experience I started to feel uncomfortable. There was a depressing energy in the pool that is still hard to explain today - it just didn’t feel right. Once it was over I was left with mixed emotions and decided to look into the industry when I returned home to Ireland. I spent some time researching the captive dolphin industry and was horrified by what I found. From the mass slaughter of dolphins to the daily suffering that these magnificent animals endure in captive facilities worldwide. I then watched the Oscar winning documentary ‘The Cove’ and decided that I had to get involved and do something to help stop this cruel industry. Whilst working on the show Flipper, I caught, trained, and kept dolphins in captivity, and I was making very good money. You might question why I stopped. I knew, deep down, that captivity was just not right for dolphins. I did not take any action until the death of Kathy, the dolphin that played the role of Flipper in the television series. 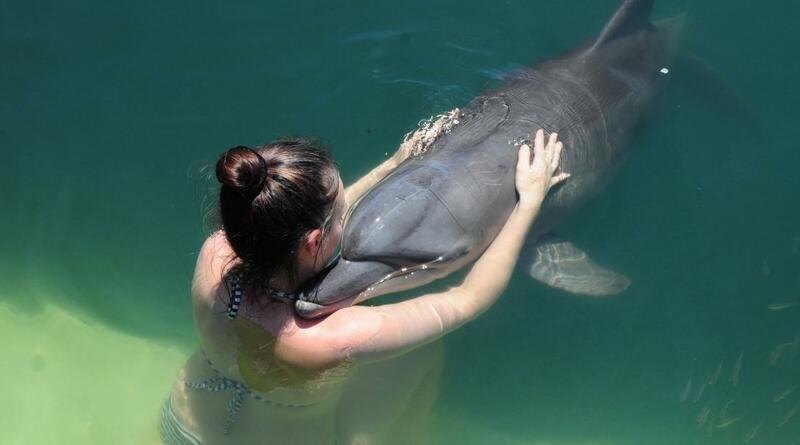 Dolphins have to consciously breathe and she chose to stop breathing, thereby committing suicide. She died in my arms. The next morning I was in jail, because I tried to free a dolphin kept in a small pen at the end of a pier. I walked away from the industry and went to work to end captivity for dolphins. How are the dolphins captured? The dolphins are often captured in barbaric drive hunts in places like the Solomon Islands and Taiji Japan, during which a pod of dolphins are herded into a bay or cove. A number of young dolphins are selected for captivity and the remaining pod members are stabbed with spears and left to slowly bleed to death. Members of the international aquarium industry take advantage of the slaughter to obtain a few show-quality dolphins for use in shows and swim-with-dolphin programmes. The huge prices that aquariums are willing to pay for live dolphins subsidises the slaughter. These dolphins are conscious of the fact that their fellow pod members are being killed, causing them huge levels of stress and fear. This is only the beginning of their suffering. Once caught these dolphins are put into a small box, loaded onto a truck and then onto a plane to spend hours flying around the world. This is an unnatural, terrifying and stressful experience for any dolphin and many don’t survive the journey. What are their captive living conditions like? Captive dolphins often exhibit abnormal, repetitive behaviour such as chewing on the walls, crashing their heads into the wall and, more commonly, being aggressive towards trainers, members of the public and other captive dolphins. Marine parks like to glorify the facilities in which dolphins are kept, using terms such as “our dolphins are kept in 14 acre/ 7 million litre salt water lagoons”. We must remember that the ocean is a dolphin's home and this covers two thirds of the planet’s surface. The bottlenose dolphins used in swim-with-dolphin programmes swim over 40 miles a day in the wild. They would need to swim around their tank approximately 2000 times to achieve the same distance. Dolphins are also very sensitive to sound - much more so than humans. Placing them in tanks with noisy water pumps, filter systems, music and cheering people exposes them to high levels of stress. The dolphins are removed from the two most important things in their lives: their freedom and their family. Dolphins are trained by giving them a reward when they do a trick right. If they don’t do the trick correctly, they don’t eat. Dolphins are the only zoo animal that has to work for their food, every day. What affect does human interaction have on the dolphins? Constant close contact with humans is extremely stressful and there are hundreds of reported attacks by dolphins on people at these facilities during interactions. Dolphins do not swim with people and kiss people and tow people because they like to — they do it because they have to. They are trained to do it and if they do not, they do not eat. There is also a danger to the public. People can be rammed into or bitten by dolphins during these programmes, and the companies hush those kinds of accidents up. Does a dolphin’s lifespan reduce in captivity? As stricter legislation is being brought into some countries to ban the importation of wild caught dolphins, captive breeding programmes are becoming increasingly common to help replenish the supply of dolphins. This often involves artificial insemination. Due to the small number of dolphins in most facilities, inbreeding often becomes a problem. The mortality rate is significantly higher in captivity and many of the calves don’t make it past the first few weeks. In an attempt to defend the use of wild-caught dolphins in their swim-with-dolphin programmes, marine parks often use words like "rescued" as it has a more sympathetic feel to it. No matter what word they use, be it "rescued", "saved" or "rehabilitated", the fact is that they were taken from the ocean - their home, their natural habitat, where they belong. The sad fact is that these dolphins will be made to work all day, every day, 365 days a year. They will be exploited for human entertainment and profit until the day they die. This is a multibillion dollar industry that is driven by money. What is your view of the ethics surrounding the use of animals for human entertainment? 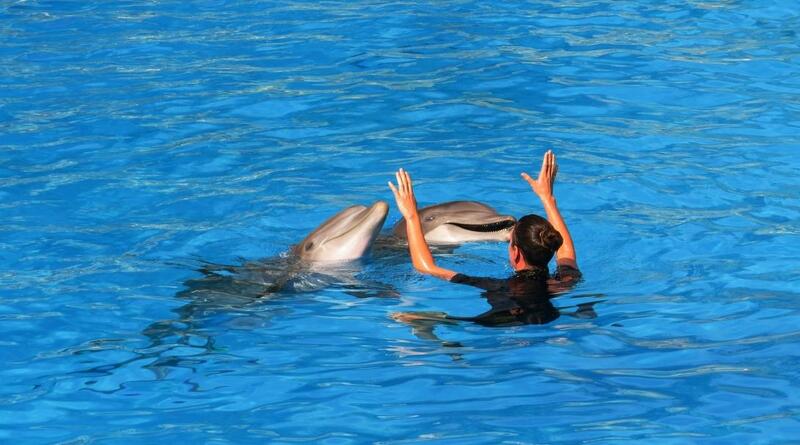 I never had a problem with animals being used for human entertainment until I visited the dolphinarium in Mexico. That experience opened my eyes and got me thinking. Up until that point I was very naive I suppose. Since then I have looked into many animal entertainment industries and have been shocked at what I have found. From animal act circuses and elephant riding to tiger petting zoos and dolphinariums - they all involve huge levels of cruelty. Following the research I have done over a number of years, I firmly believe that it is ethically and morally wrong to use animals for our entertainment. No animal should have to suffer in any form for our amusement. Many countries around the world have banned dolphinariums and the number continues to grow, with India being the latest to ban marine parks from keeping dolphins in 2013. We strongly oppose the capture and keeping of dolphins and other marine mammals in captivity. In the United States, The Marine Mammal Protection Act (MMPA) makes it legal for dolphins and other marine mammals (orcas, sea lions, etc.) to be maintained in captivity. We have been fighting for decades to convince Congress to change this, but the public display industry (headed by SeaWorld) is a powerful lobby in Washington and through the provocation of politics and greed, they have proven a major impediment to our progress. One of the arguments for keeping dolphins in captivity is the need for education and conservation – could you comment on this? The dolphin captivity industry likes to use conservation and education as an excuse to defend itself and to continue exploitation of these animals. Scientists have proven that it is ethically wrong to keep dolphins in captivity. There are no conservation benefits to support drive hunts that kill large numbers of dolphins. 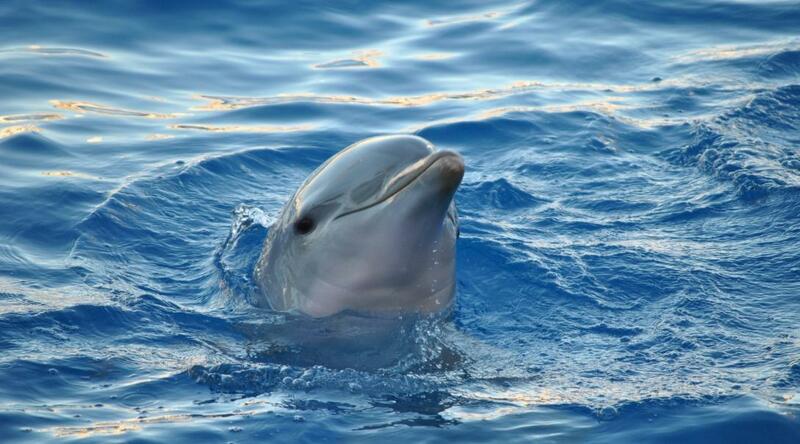 Bottlenose dolphins are not endangered and therefore there is no need to breed them in captivity. If these facilities were really concerned about conservation then they would be working to help endangered animals, not removing those that are in abundance from our oceans. As for education, "There is about as much educational benefit to be gained in studying dolphins in captivity as there would be studying mankind by only observing prisoners held in solitary confinement" - Jacques Cousteau. There is no conservation or educational benefit whatsoever in removing highly intelligent, self-aware and social animals from the ocean and keeping them in small tanks. This is just a smoke screen to allow them to continue making a profit off the back of animal entertainment that involves huge levels of cruelty. I can understand how members of the public can believe that we need to keep dolphins in captive facilities to learn about them and preserve them. I once believed the same, but once you look into the industry you soon realise that learning has very little to do with it. Should all establishments showcasing captive mammals be avoided or are some better than others? Some swim-with-dolphin programmes are worse than others, but they are all bad - bad for the dolphins and bad for people. A lot have very serious problems with water quality. Many don’t care about keeping the dolphins alive - they can just go and get more from Taiji or other places like Russia and Cuba. Regardless, dolphins do not belong in captivity. All captive marine mammal parks should be avoided. This is a multibillion dollar industry that is driven purely by money and profit at the expense of suffering animals. Some facilities make more of an effort than others to give the impression that they are a rescue and rehabilitation facility, but please don’t be fooled by this. All of the dolphins are being used for the same reason - to make as much money for the business owners as possible. What would happen to the captive animals if the tanks were emptied? There are a number of options for the lucky few that get a second chance. If suitable they can be rehabilitated and released back into the ocean. This is done over a number of months by placing them in a sea pen where they will slowly re-adapt to a more natural environment. During this time they will once again learn many things, like how to catch and eat live fish and become less dependent on humans. In May 2013 three dolphins; Jedol, Sampal and Chunsan were moved from a dolphinarium in South Korea to a sea pen. They were successfully released back into the ocean in July 2013. Only recently these dolphins were spotted swimming of Jeju Island, Korea. Many dolphins that have spent longer in captivity may have lost the skills needed to survive in the wild. The alternative for these dolphins and dolphins born in captivity would be to spend the remainder of their lives in a sea pen where they would be provided with the natural rhythms of the sea, tides and currents as well as the smells and sounds of the ocean. This environment would enrich their lives and provide plenty of mental and physical stimulation, greatly reducing their levels of stress. For those keen to see dolphins, are there any responsible alternatives? Luckily, now-a-days we have plenty of options to view dolphins in their natural habitat. 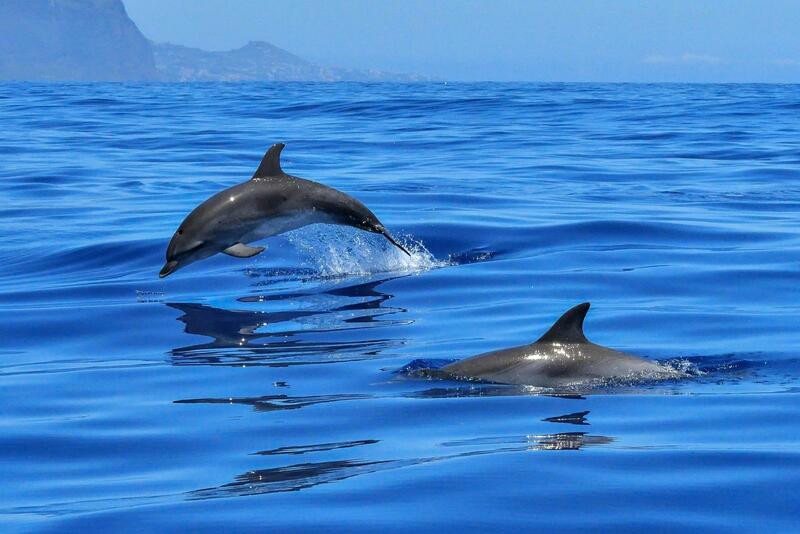 Responsible, eco-friendly dolphin and whale watching boat tours can be found in most parts of the world. These companies are easily found online. Some places offer the chance to swim with wild dolphins, often a solitary dolphin that may stay in one location for whatever reason. Although, ethically, this is a much better way to swim with dolphins, we must remember that they are wild animals and can be unpredictable! A great alternative is to go on a responsible dolphin watching tour and observe these animals in their natural environment. These are not hard to come by, and they are sustainable and economically viable, unlike dolphin shows or swim-with-dolphin programmes. ‘The Cove’ brought the annual slaughter of dolphins in Taiji to the world’s attention. How has Taiji changed since ‘The Cove’ was released? We’d been working for years on Taiji before ‘The Cove’ was released, and we continue to work on it. I think ‘The Cove’ is a great documentary and has helped immensely, but we made sure when we co-operated with the filmmakers that there would be an ongoing campaign against dolphin hunts in Taiji as part of the film. We began our Save Japan Dolphins Campaign in 2004, and since that time the deaths of dolphins in Taiji has declined by 50%. Unfortunately, we have also seen an increase in the capture of dolphins for captivity, so we are working on that front now. We are focussing on trying to stop the captivity industry from subsidising the slaughter of dolphins in Taiji by ending the captivity trade in blood dolphins. Fewer and fewer people are buying dolphin meat in Japan because of our education campaign to emphasise the dangers of eating mercury-contaminated dolphin meat. We know that from our contacts in Japan. We are trying to work WITH the Japanese people, not against them. That is why we are seeing some success. Hopefully, the market for dolphin meat will continue to decline, and hopefully we can shame the aquarium industry into ending the subsidy of the slaughter. For those passionate about dolphins, is there anything they should be doing? I would encourage people to visit our websites: www.SaveJapanDolphins.org and www.DolphinProject.net where you can learn more about what we are doing, sign online petitions, spread the word to your friends, and donate. Some people volunteer in our office to help out, and some come all the way to Japan with me to act as Cove Monitors — volunteers who stay in Taiji during the hunt season and report to the world what is happening. Everyone can help! The easiest thing is don’t buy a ticket! Don’t buy a ticket to a dolphinarium, a dolphin show, or a swim-with-dolphins programme. Dolphins belong in the wild, and that is the best place to see or experience them. I would also encourage people to watch ‘The Cove’ and ‘Blackfish’ to see how the dolphin and orca industry really works. One of the most effective ways is to spread the word that we must stop supporting this commercial cruelty and refuse to swim with dolphins or visit a marine mammal show. There are plenty of options to help out. Social media sites like Twitter and Facebook are powerful tools for getting the message out there. 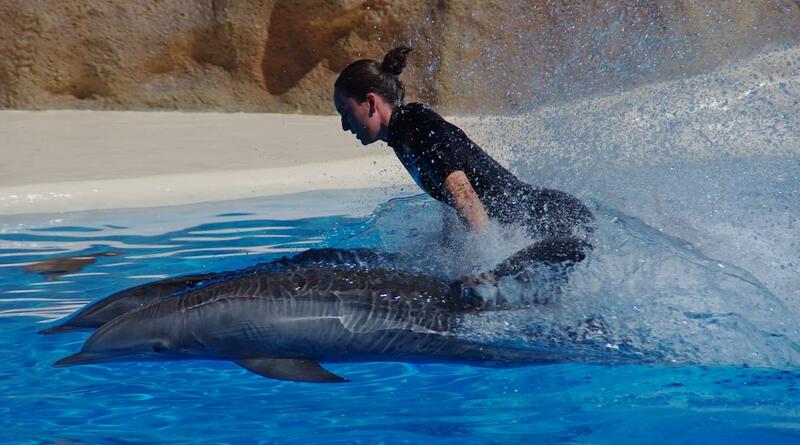 Most people who take part in swim-with-dolphin programmes or visit dolphinariums are unaware of the cruelty involved. Raising awareness and educating people is the key to stopping this industry. By sharing posts on Facebook and retweeting on Twitter, your friends will become more aware of the problems surrounding the captive dolphin industry, making it less likely that they will visit such facilities. Attend any demonstrations if possible. These are always very peaceful and are designed to raise awareness. This year’s Empty the Tanks demonstration on the 24th of May was held in over 50 locations worldwide. On September the 1st 2014, the Save Japan Dolphins event will take place. In 2013 this event was held in 117 locations around the world with over 16,000 people taking part. People see the dolphin smile and they think everything is alright. It’s not alright. Dolphins smile because that is the way their faces are built for swimming through the water. They do not have muscles on their faces like we do to show their emotions. A dead dolphin is still a smiling dolphin!